I was recently asked to review Vita Sciences Maxasorb Melatonin Cream. I was sent this product for free in exchange for my honest review. This product is wonderful for those that may have sleep disturbances, as I do. I find that is very hard for me to fall asleep at night and just turn everything off in my brain. When I do take an over the counter medication it leaves me feeling very sleepy the next morning and can really put me behind for my whole day. That's one of the great benefits of Maxasorb Melatonin Cream, it contains all natural ingredients and aides in helping you fall asleep faster. It even helps with your alertness during the day and reduces the amount of fatigue you may have during the day. One of the best benefits, in my opinion, to this product is no pills!! You simply rub the cream on your skin. Very simply to apply and the bottle delivers measured amounts of product (3mg of Melatonin in every pump), it's fool proof. Each bottle contains 1.7 oz and that equals out to 60 applications. The lotion itself is grease less and very moisturizing to the skin. It's scent free and hypoallergenic. Which is great for those of us that have Eczema issues. All in all I would say this product could be a great asset to those that suffer from insomnia or even delayed sleep. 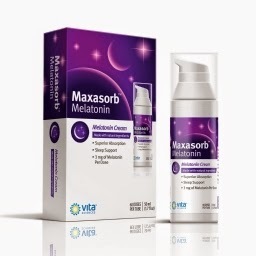 For more information on this product, please visit their website at http://www.vitasciences.com/maxasorbmelatonin.